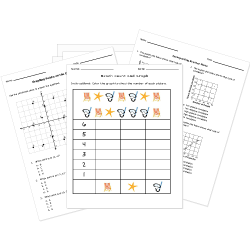 Use our collection of graphing worksheets featuring bar graphs, histograms, number lines, coordinate planes, line plots, and scatter plots to support your teaching of graphing. Don't see a printable you need? Use our Test Maker™ to create your own printable that fits your needs. Use our advanced search to find existing questions while filtering by grade levels and keywords.